I promised more Christmas playlists (click here for my Christmas classics playlist), so here I am with another one. I love the holly, jolly festive feeling this time of year, but even more than that, I love the quiet, peaceful feel at Christmastime. 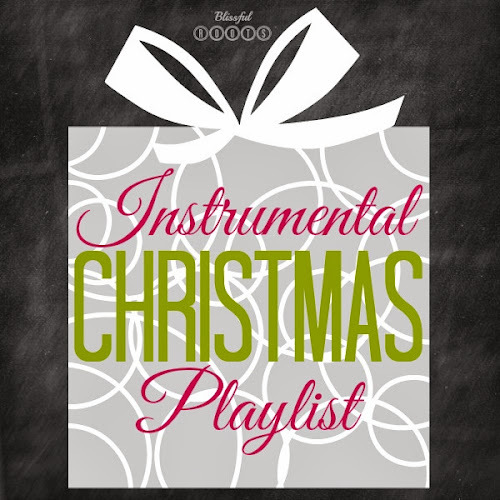 Here's a list of some of my very favorite instrumental Christmas songs. I love to turn all the lights out, except for the tree lights and play this mix at night. My boys fall asleep listening to some of the songs on this playlist (we have the whole Christmas Lullabies CD found on my playlist). Their room is so cozy on these cold December nights. The glow from their tiny tree lights, and the soft music playing is the perfect way to end the day. Once again, if you have a Spotify account you can listen to my entire list. Spotify is free, so go ahead and get yourself an account if you don't already. Stop in next week for my religious/spiritual Christmas playlist (my favorite!). there is nothing like christmas music to lift the spirits and transport us to a simpler time and childhood! Hey, Michele. I can't not have music playing this time of year. It goes by so quickly, and I don't want to miss a minute of feeling festive. I'm on my way over to visit you. Thanks so much for visiting! Come back anytime, and Merry Christmas! Very interesting For shaving cream and Easter egg food I like very much. Melanie Lockert founded the blog Dear Cheap Cosplay Wigs Debt in 2013 to chronicle her journey of paying off $81,000 in debt and hold herself Lace Front Wigs Cosplay accountable. With a mix of humor and sometimes heartbreaking honesty about what it's like to live with burdensome debt, she tapped into a community of people who were longing for someone to acknowledge the emotional side of debt and speak openly about its impact on mental health. Even if superhero stories aren your thing, the acting on display here by Jackson and McAvoy look to be an absolute joy to watch; Willis less so, but we don get to see too much of Black Cosplay Wig his performance here. (And keep your eyes on Paulson not so good Dr. Ellie Staple; experience with Shyamalan stories tells us there might be more than meets the eye going on with her character.) Glass should absolutely be on your must see watch list and could even be an awards contender. The character Cherry Darling from the movie Planet Terror startled folks when they saw that one of her legs was a machine gun. Then it inspired some women to recreate the scene. Now, if you are a beautiful amputee like Lacey Henderson, who gained note as a college cheerleader a few years ago, you can make hay by cosplaying the character at fan events. Henderson has a webpage with instructions for those who aren't amputees on how to recreate the Cherry Darling look, and an annual competition is held for the best machine gun leg costume. He is Lace Front Wigs Cosplay getting airtime to prepare for his day in court with the Doctor, because it will come Cheap Cosplay Wigs out that Doctor was a quack and all washed up in debts.Last blog, Bill, Ottawa Canada.the autopsy showed that there were no signs of any heart condition (on the first autopsy) and no signs of trauma to the body ect ect. The "norm" is killing society. Never in our history has there ever been so many self help books written, so many people on anti depressants, so much obesity, depression, divorce, struggles with allergies, and pollution. It's time to get back to our roots and to Black Cosplay Wig stop following the "norm." Our families depend upon it. "I'm at such an incredible place in my life," she told the Washington Post in 2005. "I've been married for three years next month, and we've been together for four years. My dad and my mom and I have never had as good of a relationship as we do now. I've been through all the hard stuff. I hope I've been through enough of it to last me for a while. ".